Sam Clovis standing next to Trump during the campaign. Trump has nominated a non-scientist to be chief scientist at the U.S. Department of Agriculture. This is an outrageous slap in the face to science. It's also a slap in the face to Congress. 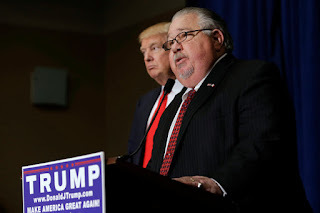 As I predicted back in May, Trump has nominated Sam Clovis, a former right-wing radio talk show host and failed Senate candidate from Iowa, to be the chief scientist of the USDA. ProPublica was the first to break this story, and they also pointed out that Clovis was a vocal climate change denialist. Clovis has an undergraduate degree in politics and graduate training in business, but he has no formal training in science at all. Clovis does have one qualification, though. As ProPublica pointed out, he has been a "fiery pro-Trump advocate on television." Sounds like a good candidate for a chief scientist job to me. The law also says, just to make it crystal clear, that the Under Secretary "shall hold the title of Chief Scientist of the Department." Overseeing the USDA's research programs requires strong expertise in biological science. A non-scientist has no basis for deciding which research is going well, or what questions need further study, or which questions present the most promising avenues for research. A non-scientist is simply incompetent to choose among them–and I mean this in the literal sense of the word; i.e., not having the knowledge or training to do the job. This does not mean that I think Sam Clovis is incompetent at other things; I don't know him and he might be very capable in other areas. Among other problems, a non-scientist leader of a scientific agency will be incapable of using scientific expertise to set priorities, and instead can make up his own priorities. If the Senate has any backbone at all–if Republicans are willing to show that they are capable of doing something other than rubber-stamping every action, no matter how damaging, of our self-absorbed, ignorant President–then they will turn down this nomination. Sam Clovis is so obviously unqualified that this should be easy to do. The Senate's Republicans have confirmed all of Trump's nominees so far, and I fear they will rubber-stamp this one as well. Let's hope that a few of them (and only 3 have to object, assuming all 48 Democrats vote no) realize that appointing a non-scientist to be Chief Scientist of the USDA is a slap in the face not only to science, but to Congress itself, because the appointment scoffs at Congress's own law, passed during the George W. Bush administration. Trump can find another political appointment for Sam Clovis, as he has for other Trump loyalists. But appointing a former talk radio host, a non-scientist who has never published a single scientific paper, as the Chief Scientist of the USDA is a gross insult to the thousands of hard-working real scientists at the USDA, and to millions more who depend on, and benefit from, the USDA's research programs. Senators: do the right thing and tell Trump to appoint a real scientist to this job.